Letter #6 "The SNAFU maru"
Note: The Picture is an original from TSgt. Allan. At "27 Mile Strip," Darwin, the finishing touches were not yet quite done, so we used a grass field at Adelaide River for about two weeks. Down on the lower side was a lonely old war-weary P-40. We named her the "SNAFU maru.' (Editors note: If you don't know what SNAFU means, you'll have to ask a veteran). She sat there all the time! Whether she was just worn out, or because of a superstition, she never flew again. She was left there when we moved onto our new strip. Later, in the war (possibly I heard of it after the war was over) there was a U. S. cemetery there at Adelaide River. I presume some of our early casualties were buried there. The last time I heard about it, in a magazine article, all the graves were exhumed and re buried in a cemetery in Sydney. I wonder where ole SNAFU maru is buried. The Northern Territory was wildly amazing. There were many termite mounds, some twenty feet or more in height. These larger ones were several feet wide -- eight to twelve feet. The most amazing thing about them was that their placement on the ground was always oriented North and South. They were thought to have some kind of magnetic quality. A lost person could pretty much count on them as true North and South. Yes, I'd heard of termite mounds before, but seeing them in person is unforgettable. One day, I decided to see what was inside of one of them. I rammed one with the front bumper of a Six by Six Army truck. Nothing! So I backed up and hit it a little harder. Still, nothing. They were like concrete! The only damage done, was to the truck. I managed to knock the front bumper off. I never did get to see what was inside. When I returned to camp, I came up with a good excuse for the damage or I'd be paying for that truck yet! The Darwin area was the home of several thousand Aborigines. Every so often, out in the 'Bush,' they had large flat places on the ground. These places were made rock hard earth by being stomped and danced on for thirty thousand years. This was fortunate because they were large enough to accommodate an emergency landing. Several pilots owed their lives to them. Not so many years ago, the Aborigines were mighty hunters and trackers. They are now content to be wards of the state doing little or nothing. The reservation authorities take care of all their wants. In times past, in the wild, they built no shelters, camped when the sun went down and slept with their dogs to keep warm on chilly nights. When it rained, they squatted on their haunches until the rain stopped. Do you remember a rock group in the limelight a few years back by the name of "Three Dog Night?" That name came from the Aborigine culture. Even in the tropics, it still got cool some nights. The natives the next morning sometimes spoke of how cold the previous night was by how many dogs were kept in the pile of people to keep warm. A"Three Dog Night" was very chilly. The wild, rugged vastness of the N. W. area, was good for nothing, except national parks. It was fabulous for scenery. Much of it very beautiful, like our Grand Canyon. "Crocodile Dundee" movies show more of that than anyone can describe. Fresh water crocodiles can cause some damage, but salt water crocs are the ones to stay away from! They can swallow you whole! 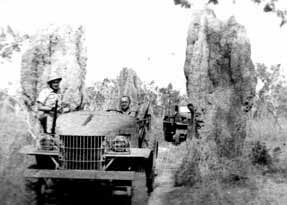 When we first got to Darwin, we were far ahead of supply shipments (some of our supply ships were known to have been sunk by Jap subs.) We were almost starving. Except for what could be found in the Bush, such as bananas, melons, coconuts, and mangos we had nothing. We finally began getting "Lend Lease" stuff. We got Aussie 'bully-beef' (like it was chopped up with a broad axe), mutton, and horse meat. We did get some bread, made at night. It looked real good because it was filled with caraway seed. I was really all set to enjoy it when, upon closer inspection, I recognized the seeds as bugs. They were drawn to the night baking. When our stuff finally began arriving, it was still given to the Aussies, even our best, such as hams, chicken, etc. We missed our own coffee, and big five cigarettes the most. Actually, I liked the horse meat. It was very red and sweet, almost as if a little sugar was sprinkled on it. The group commander said it was "Lend Lease in reverse." We all laughed, of course! The big five cigarettes were never seen again but the Aussies were smoking them all the rest of the war.